( DIESEL Warrior has a printed exp date of 03/2018. The product is not expired and good until at least 01/2020). Now available, GET DIESEL’s DIESEL Pharma division has released the most performance driven multivitamin pack in a multi-pill format so you the consumer can control the dosage. So what is DIESEL Warrior? 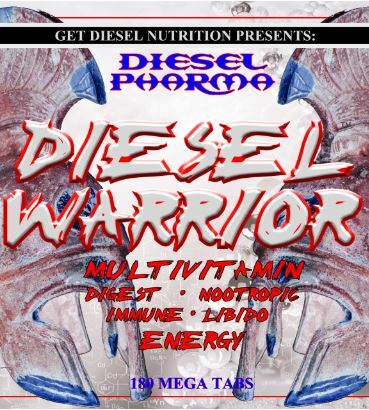 DIESEL Warrior is a high performance multivitamin pack that comes in an all in one pill. You do not take one pill a day (you take 4-6 a day), but it allows you to scale your dosage based on body weight. Traditionally with training packs you have to take all or none. They come with several pills; each one may be only one ingredient or blend such as a B-Complex or vitamin c. With DIESEL Warrior, all of the actives are in every pill so you can decide how much you get. Diesel Warrior is also what we call a “foundation supplement.” Foundation supplements are those you build your supplement base from. Sometimes called essentials, you need them for the most basic and complex processes in your body. For instance protein powder would be a foundation supplement. If you are not getting the required minimum grams per kg for your body weight, you are wasting your money on lean muscle mass building products. The same would go with how you should view Diesel Warrior. This is a blend of high quality vitamins and minerals, nootropics, digestion support nutrients, immune system boosters, libido maximizing ingredients and last but not least energy enhancers. Sounds like a lot from one supplement doesn’t it? Well at GET DIESEL, we don’t do ½ complete products to encourage you to take three or more products to receive one favorable end result. If we are going to do a foundation product, it is going to cover several foundation bases versus releasing three different products that we could have sold for $20 each. If you think about your training goals, supplementation needs and level of performance you wish to achieve at work, training, school, recovery or at play, the target results revolve around getting much needed vitamins. In addition you need to be mentally sharp (nootropics), having good digestive health, a strong immune system (to help prevent colds), optimum libido (which drops with age) and heavy training and optimum energy to get through the day. There are no “Gainz” without proper absorption of nutrients. Today, most people live a busy life style with work or school and there is little time for proper meal preparation and consumption of high amounts of fresh foods that provide high bioavailability of nutrients and optimal digestion. When your day is filled with dairy based, artificially flavored and artificially sweetened protein drinks, fast food, freezer food, refined sugar food, your digestion, over time will suffer. You will absorb less and less from your meals and supplements. Often athletes feel they are sluggish and need a higher dosage of pre-workout drinks because the previous dose isn’t strong enough anymore, but that’s not the problem usually. The problem is cheat days, white flour products, soda, etc. has overtime lessened your nutrient absorption capabilities from optimum when you were around 12 years old to “so-so.” Diesel Warrior contains a natural digestive blend that includes pineapple and papaya enzymes (bromelain and papain), as well as lactase enzymes (for dairy digestion), cayenne pepper and bioperine which greatly enhances food nutrient absorption as well as the bioavailability of other nutrients in DIESEL Warrior. GET DIESEL NUTRITION was arguably the first company to introduce nootropics to the sports nutrition supplementation world in 2002 with the release of our energy/pre-workout capsule product DIESEL FUEL ™. Since introducing herbs such as Rhodiola Rosea (endurance, mental focus) and Bocopa (memory, reflexes) to sports nutrition, other products have come along that include nootropics, but no other brand has more effective legal, nootropic blends in their products. Diesel Warrior’s nootropic blend comes in at over 700mg per three tablets and can be sold as its own product (just the nootropic blend) for about $25 per bottle. The nootropic blend helps to maximize oxygen delivery to the brain, memory (both short term and long term), enhance motivation, drive, and mood. As a foundation product, Diesel Warrior helps you stay focused on task you need to achieve and as with GET DIESEL’s pre-workout products, the nootropic blends motivates and gives you the drive to push and work harder. The Sunami libido, natural testosterone/estrogen support blend is what we do. GET DIESEL is known for its herbal hormonal optimizing products such as DIESEL TEST (test booster) and E2-X (anti-estrogen) and has been cranking out test and libido boosters for over 10 years (since 2005). No matter if you are using Diesel Warrior for general nutrition, better performance in the gym, cardio, etc, there is a correlation between motivation, mood, and libido. When your libido is low, typically so is your overall feeling of happiness. On DIESEL Warrior, you can expect consistent libido especially when stacked with other GET DIESEL test boosters. This blend also works to reduce stress by working with the Mind Right nootropic blend to maximize dopamine levels. Raise your hand if you feel being sick is the best way to get results from training. No hands are raised. Immune support is like a shield helping to keep your overall system working at optimum efficiency because no one wants to be sidelined with sinus problems, headaches, chills, fever and so on. Simply put, with ingredients such as echinacea, grape seed, rosemary and astaxathin, having DIESEL Warrior as your multi will also help make you less susceptible to a weaker immune system which is typical of stressful jobs and training. Last but not least; The DIESEL Energy blend. Let’s see hands go up for anyone who likes being sluggish and moody because they just can’t seem to have the high levels of energy they need for their busy schedule? No hands again right? Diesel Warrior provides that foundation you need for optimum energy levels. Ingredients such as schizandra berries, ginseng and guranna seed work to naturally increase cellular energy production. With Diesel Warrior being time released, for optimum delivery of nutrients versus just “shot gunning” your body with high amounts of vitamins and herbs, you are provided with a subtle, all day boost in energy. Diesel Warrior will also make your pre-workout, energy drink and drinks such as coffee hit a lot harder so you may need to reduce their dosage while on Diesel Warrior. Typically with vitamin packs, you are instructed to consume one or two packs daily, with each pack containing about 10 pills. Traditionally with vitamin packs, you cannot take less or more, it’s all or nothing. Our 120lb Jiu-Jitsu players do not need the same amount of vitamins and herbs as our 180lb Jiu-Jitsu players. Our 220lb to 280lb+ powerlifters need more nutrients than those under 200 pounds. With existing vitamin packs, there is no way to scale down or up the dosage you either take all the pills in the pack, or you don’t and miss out on key nutrients. With DIESEL Warrior, your daily dosage comes in the form of three to six tablets, where you can modify your dosage for all the vitamins, minerals and herbs by taking more or less. As a performance multivitamin, Diesel Warrior DOES contain Zinc, and a highly bioavailable form of it at that (Zinc Monomethionine). Often when consumers look for a high quality multi, they have no idea where to start. The easiest tip is to start at the form of zinc contained in the product. You see, zinc oxide is the worse absorbed form of zinc, and is absorbed at efficiency over 10x less than zinc monomethionine. It’s basically useless, but time and time again you see zinc oxide and magnesium oxide in mult-vitamins. Why you say? It’s cheap and most consumers just look at the label and if they see 20mg of Zinc they assume all zinc (and vitamins for that matter) are created equal. Some popular sports nutrition multivitamins will leave zinc out of their product and claim zinc prevents the absorption of copper, iron and aminos but this is actually false. It’s more like iron and copper fight for absorption against zinc. Protein actually enhances the absorption of zinc. Some forms of protein powders such as casein and individual aminos can slow zinc’s abortion, but on a whole, it’s good to take zinc with protein rich meals (1). One other manufacture actually left zinc out of their multivitamin with the claim that because it fights with iron for absorption, they would rather include iron! A problem with iron is some people retain iron at a much higher rate than others and with the recommended intake of mufti-vitamins suggested at daily, you may not need iron supplementation on a daily basis. As an athlete, you can easily say approximately 90% of all of you guys and gals need more zinc than what you get in your diet. Very few none anemic people on earth are deficient in iron. Those who are low in iron are put on a specific iron supplement and diet to help correct iron levels. Athletes are more prone to lower iron levels than non-athletes, but there is no reason to bypass zinc in a multivitamin because it competes with iron for absorption. Aminos compete for absorption, but you still eat complete protein sources don’t you? Even the USDA’s website states athletes need more zinc after a study showed that zinc is needed for optimal muscle contraction and energy production (2). Zinc helps your immune system, thyroid activity and testosterone production. Zinc is needed by the testes to produce testosterone and those who do not eat red meat or seafood are almost certain to have a need for zinc supplementation. Diesel Warrior a nice addition !! Diesel Warrior High Performance Multivitamin - Digest - Immune Nootropic (Mental Focus) - Energy The first thing I noticed after starting to take this was the probiotics in the Diesel Warrior made for better bowel movements and digestion. I also liked the Metal Focus and the Felling of Well Being!! Another good addition to the Get Diesel Line-up ! !